ABSTRACT: In this paper, a novel particle swarm optimization (PSO) technique is proposed to tune the proportional-integral (PI) controller gain parameters for enhancing the dynamic performance of the shunt active power filter (APF). The shunt APFs are well established filter to compensate current harmonics, reactive power to maintain the power factor unity. The compensation is highly influenced by the DC-link voltage regulation. The calculated PI controller gain parameters conventionally, are giving satisfactory results under steady state condition of the load. 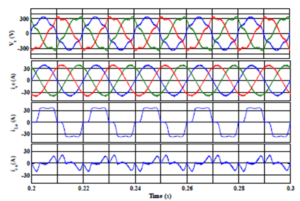 However, tuning of the PI controller parameters under fast changing loads are very difficult. To improve the dynamic performance of the system and optimize the gain parameters of the PI controller, a PSO technique is proposed. 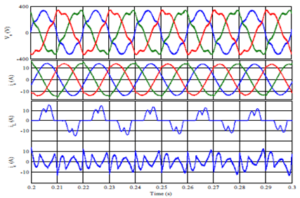 The modified p-q theory uses a composite observer filter to extract fundamental component of voltage from the distorted supply voltage for the further process of calculating reference current. 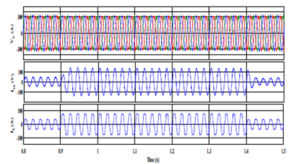 A complete comparison of conventional and PSO based PI controller gain tuning have been simulated using MATLAB® Simulink software under different supply voltage and load condition of the system. The results show that the dynamic response is improved with PSO based PI tuning compared to conventional PI tuning. The performance of the proposed PSO based modified p-q theory has been designed for different types of loads and supply voltage conditions. The modified composite observer filter is an extracted fundamental frequency component of voltage from distorted supply without phase delay which further processed in the calculation of the reference current. The comparison of conventional PI tuning and PSO based tuning is tested for dynamic condition of the load. The proposed control scheme is modelled in MATLAB simulink environment. 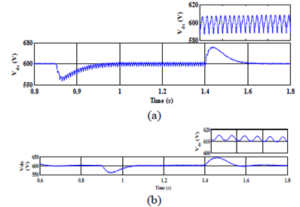 The simulation results show that the PSO based tuning provide less overshoot, ripples in the DC-link voltage and lesser settling time as compared to convention PI tuning. S. Adamu, H. S. Muhammad and D.S. Shuaibu, “Harmonics Assessment and Mitigation in Medical Diagnosis Equipment”, IEEE international conference on Awerness Science and Technology (iCAST), pp. 70-75, 2014. Akagi, “Active harmonic filters,” Proc. IEEE, Vol. 93, no.12, pp.2128-2141, pp.2128-2141, 2005. H. Bollen, Understanding Power Quality Problems: Voltage Sags and Interruptions, John Wiley & Sons, 1999. Akagi, E. H. Watanabe, and M. Aredes, Instantaneous Power Theory and Applications to Power Conditioning, Piscataway, NJ: IEEE Press, 2007. Gupta, S. P. Singh and S. P. Dubey “Neural network based shunt active filter for harmonic and reactive power compensation under non-ideal mains voltage,” In proc. of IEEE Industrial Electronics and Applications (ICIEA), Taiwan, pp. 370-375, 2010. 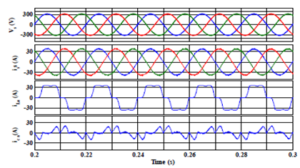 This entry was posted in Blog, website and tagged Improved Dynamic Performance of Shunt Active Power Filter Using Particle Swarm Optimization, Particle swarm optimization (PSO), PI controller, Shunt Active power filters (SAPF). Bookmark the permalink.